George Wright, a middle school science teacher, developed these unique visual aids to help illustrate the formation and evolution of stars. 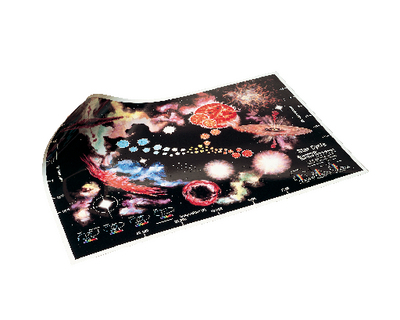 The beautifully illustrated H/R Diagram allows students to determine the color of the main sequence stars as they pertains to temperature and luminosity. Students also color, cut, and paste the star cycle activity from nebula to red giants or SUPERNOVAS then back to cosmic dust again. Students can also discover how spectral analysis is used to distinguish binary star systems from single stars. Worksheets in the student's guide reinforce facts and concepts shown in the poster. A reproducible hands-on star diagramming activity is also included in the complete kit. Includes: full-color poster, transparency, teacher's guide, and reproducible student guide, worksheets and activity sheets. For added convenience, we've reproduced a complete class set (for 30 students) of the star diagramming activity sheets on heavy cardstock (Item #470003-964).